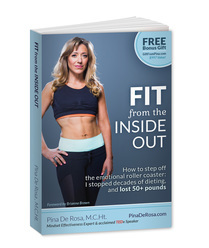 What is "Fit From the Inside Out" all about? ...How is it different? Fit From The Inside Out. After her acclaimed TEDxTalk, and after co-leading the TheNewHollywood's Get My Body Back 2 Elective with Brianna Brown, Pina De Rosa was inspired to take her health & fitness results to a whole new level, and ended up writing a book about her journey to finally getting her body back. For those who are tired of the emotional rollercoaster, this book is a journey that gets us to look beyond the “how" into the “why”, giving access to the missing piece of the puzzle that most people don’t know about: how to recognize that there is self-sabotage, how to reach out for the appropriate support, and what to do differently that will make a difference once and for all. Results are not achieved with willpower alone, nor with just diet and exercise, but by exploring the deep seeded emotional blocks that keep us from achieving what we want to achieve. Not everybody is raped, and not everyone needs to lose 50 pounds, but nearly everybody has some emotional blocks that are preventing them from getting where they want to be.